Pool, Annelies. "Fort McPherson". The Canadian Encyclopedia, 12 July 2016, Historica Canada. https://www.thecanadianencyclopedia.ca/en/article/fort-mcpherson. Accessed 26 April 2019. Fort McPherson, NWT, incorporated as a hamlet in 1986, population 792 (2011c), 776 (2006c). 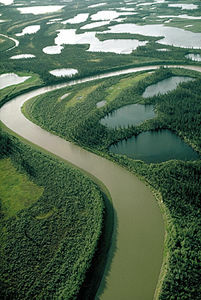 The Hamlet of Fort McPherson is located on the east bank of the Peel River, 210 km south of Inuvik on the DEMPSTER HIGHWAY. Named for a Hudson's Bay Company trader, the settlement has been a Gwich'in village since 1852, when the Gwich'in moved there because the site commands an excellent view of the MACKENZIE RIVER delta. It was the home of Chief John Tetlichi (1918-1983), who became the first DENE member of the NWT Territorial Council in 1967. Another notable is Wally Firth, who was elected in 1972 as the first native Member of Parliament. Although the community has now been influenced by the construction of the Dempster Highway and oil exploration, the Gwich'in inhabitants maintained an independent lifestyle well into the 1960s.